The Sunwell MT model is a Form & Trim In-mold Thermoforming machine, with automatic, servo electric mechanical drive system that includes an additional tilting movement and automatic stacking system. The MT model is applicable for all typical thermo plastic materials, particularly for products that require precise trim tolerances such as deep draw PP Containers of Drink Cups. 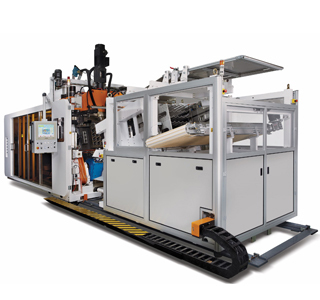 This model of machines can be configured to run roll fed or in-line with extrusion line. The state of the art technology is energy efficient and easy to operate with minimum maintenance required. The top platen is for top mold with male plugs controlled by servo system for uniform wall distribution control. The bottom platen is movable, driven by a conjugated cam system for the forming process and final trim action that enables the mold to tilt by 75 degrees to allow thermoformed containers approach to automation system for the stacking. i- Waterfall Automatic Stacking System. ii- Mandrel Swiveling Automatic Stacking System. Both can conjugate with automatic packaging system for light weight quality thermoformed containers on fast speed production. The scrap bridge conveyer guides the skeleton scrap to an in-line post-granulator or winder, which are located downstream or turn 90 degrees to the right/left hand machine side to minimize the space requirement and manpower. The state of the art MT technology is truly global and aims at energy saving, operation friendly, supreme quality, efficient production and minimum maintenance ensuring customers gain maximum profitability. Max. Cycle Speed 45 cycles / Min. 40 cycles / Min.